Today was the day I have been waiting for for years and I didn’t even know it. One of the major reasons I came on this trip was to meet my sponsor child. I knew I would be able to, but I didn’t know when. It was our first day in the village, we were greeted by a parade of Ugandans and a huge dance party. 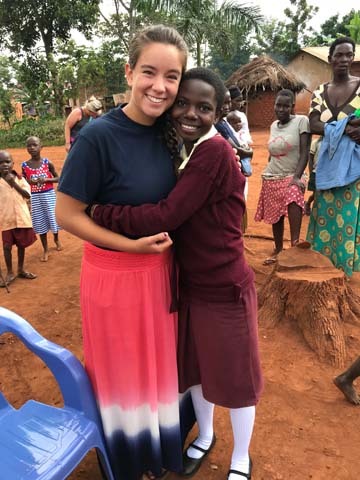 Before I knew it, we were seated in a half circle with Ugandans surrounding us, we had a time of introductions where we went around the circle and Rory said our names and who are sponsor kids were. Something that stuck out to me was how every time they would say who we sponsored a part of the crowd would go crazy, the parents would run up and hug us while the crowd would cheer. It was a time to remember. Right after this, a bus pulled up with a group of school kids, and before I knew it my child was in my arms and both of us were sobbing. I told myself the day we met I would try to keep it together the best I could, but I soon as my child hugged me she started crying, and at the point, I lost it. Before this trip, I thought of sponsorship as something you just did as a Christian. I figured sponsoring was helpful, and that somewhere somehow, I might be making a difference, but this trip has completely changed those thoughts. Don’t get me wrong, I completely love my child and could not wait to meet her, but I was wondering how much a difference I actually was making. To see the impact that this program has on these families is life changing. Seeing how education is truly a gift and how it can really change lives is beyond impactful. To see how far the village has come since starting the program is astounding. It’s safe to say I see the program through new eyes. The people of the village seriously consider you as family, and love you to the ends of the earth. To see the difference one person and $32 can make is incredible! That’s incredible! I can’t wait to meet my kids and their families one day! Obeying God always makes a difference I our lives and in the lives of others.